Know Your H2O: County offers Half Price Rain Barrels! 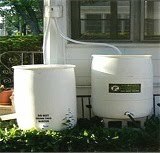 County offers Half Price Rain Barrels! San Diego County is offering HALF-PRICE RAIN BARRELS for County Unincorporated Residents this August 28 from 8 a.m. to 12 p.m. at the Water Conservation Garden, 12122 Cuyamaca College Drive West, in El Cajon. It may seem like it never rains in San Diego but did you know that just 1 inch of rain falling on a 1,000 square foot roof will yield 600 gallons of water? Instead of letting all of that water run into the stormgutter, that's water that could be used for watering a veggie bed, potted plants, rinsing your wetsuit, or watering your native garden! Check out the County's Rainbarrel Page for more info! What is your Landscape Water Use?